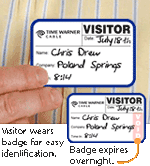 MyNameBadges, like the rest of the SmartSign stores, provides some of the very best products and user experience on the web. But, don't just take our word for it. Check out our hundreds of reviews from actual paying customers. And, as always, we're here to help. Any questions? Give customer service a call, at (800) 952-1457.
easy to order and shop. Easy and straight forward instructions. Easy to use, clear instructions made ordering easy. Easy to navigate & free shipping! Easy to use. Simple layout, nothing complicated was there on site. Easy to use. Everything was good! I always order from this site and I'm always happy with every order. Easy to order what I needed. It was very easy to design my badge. The site was fairly easy to use. Easy to navigate and build your own badges. Lots of varieties are available. There are plenty of options to review order. Very easy to make the perfect name badge! The quality is great as well!